With color A, cast on multiple of 6, + 2 sts and knit one row. Row 1 - Righ side: With Color B, k1, sl 1 , k4, * sl 2, k4; rep from * to last 2 sts, sl 1, k1. Row 2: With Color B, p1, sl 1, p4, * sl 2, p4; rep from * to last 2 sts, sl 1, p1. Row 3: With Color A, k1, sl 1 , k4, * sl 2, k4; rep from * to last 2 sts, sl 1, k1. Row 4: With Color A, k1, sl 1, k4, * sl 2, k4; rep from * to last 2 sts, sl 1, k1. Row 5: With Color B, k3, * sl 2, k4; rep from * to last 5 sts, sl 2, k3. Row 6: With Color B, p3, *sl 2, p4; rep from * to last 5 sts, sl 2, p3. Row 7: With Color A, k3, *sl 2, k4; rep from * to last 5 sts, sl 2, k3. Row 8: With Color A, k3, *sl 2 , k4; rep from * to last 5 sts, sl 2, k3. Rep rows 1 to 8. 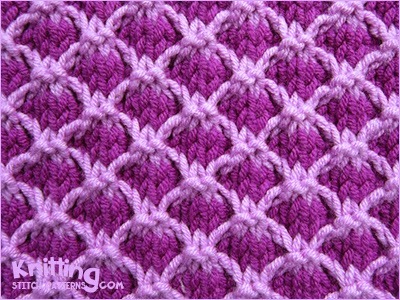 K: Knit | P: Purl | Slip stitch purlwise: Sl. On the knit side, you hold the yarn in the back when you slip the stitch, and on the purl side, you hold the yarn in front when you slip the stitch.